--Easy to carry, it suits for every occasions, home, office, car and so on. --High-quality four-core copper wires enhance charging & data transfer speed of the lightning cables. Extra long(3/6/6/10FT Rose Gold) is ideal for the long distance usage at home,in your office,car and more places.Never worry about not having sufficient reach from your USB charger cable. 1*3FT Length nylon braided iPhone USB Charger. 2*6FT Length nylon braided iPhone USB Charger. 1*10FT Length nylon braided iPhone USB Charger. We Offer 12-month warranty and friendly customer services. Lightning Cable Material-Nylon Braided : Highest standard of quality cables, Used the compact heat resistant aluminium alloy terminals. Tangle-free and well-constructed nylon braided cord has an ultra-high 5000+ bend lifespan, which largely improve its durability and ensure complete safety. Compatible With: Our lightning cable compatible for iPhone X, iphone8/8 Plus iPhone 7/7 Plus, iPhone6s/6s Plus, iPhone6/6 Plus, iPhone 5/5s/5c, iPad Pro/iPad Air/iPad Mini and more apple devices. Unparalleled Durability：Charger Cable for iphone,Lightning cables offer you more choices, moreover, it is a perfect symbol for lovers.Original 8 Pin connector with a lightning end. The anodized connectors ensure superior functionality under heavy usage. 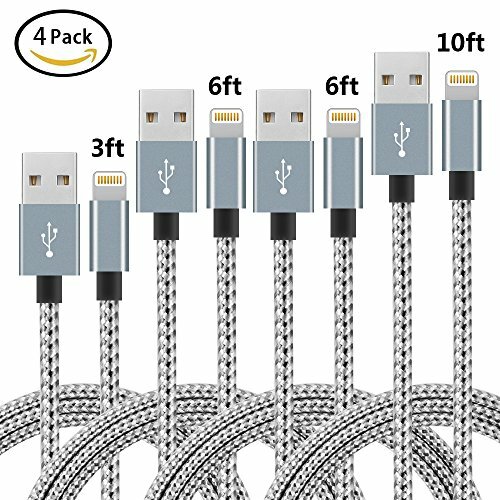 Safe Fast Charging: 3FT 6FT 9FT Lighting cable meet all your needs--Different length Lightning iPhone Charger can be use with wall chargers, car chargers, adapters, multi-port desktop USB chargers and power banks. We offer excellent after-sales service within 6 months for your confident purchase. If you have any questions about this product by Nanming, contact us by completing and submitting the form below. If you are looking for a specif part number, please include it with your message.